I started walking Cookie and Creme together, thinking that once in a while, the feline needs some fresh air too. 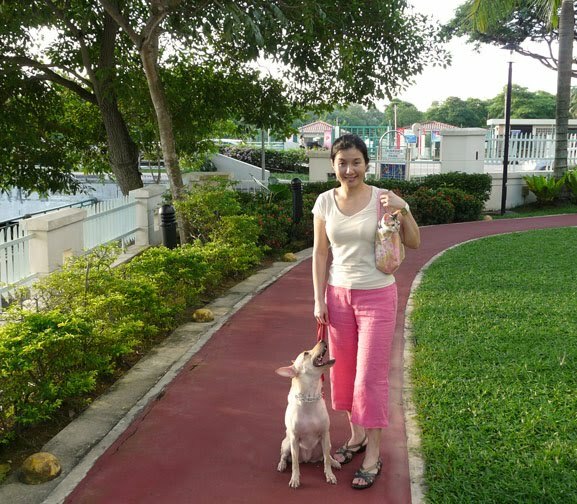 "Nobody walks the cat lah...have you seen anyone walking a cat?" These are the reactions from Vincent. Yes, I agree to some extend but if I were a cat, I think I'd want to get out and smell the trees, the air, the grass. I'd be bored being surrounded by walls. So, I do what I think it's the best for the cat, according to my thinking (I could be wrong). Of course I won't put a collar and walk Creme on a leash, that would be hilarious. I put her into my Jim Thompson (canvas) bag, and let her head sticks out of the bag. It's like a sightseeing ride for Creme, I hope she appreciates it. Initially, Creme tried very hard not to get into the bag. I have to work very quickly - plonk her in and zip up quickly. Creme struggles, but once she is out of the house, she settles down, looking everywhere curiously. Whenever she sees Cookie running, she has an urge to jump out to join Cookie, just like how she behaves at home. I think Cookie is thrilled to have a walking companion other than myself! Sometimes the walk is bumpy for Creme (being in a hanging bag) so she will put her paws up on the edge of the bag to stabilise herself, much like how us hang on to the pole in MRT train. We bumped into other dogs sometimes. Whilst Cookie is keen to socialise and frantically wagging her tail, Creme would make that "hummm" sound in her deep warning voice, which perhaps translates to "get lost" in her language. We are making progress each time I walk both of the animals together. I hope one day, I'll be able to let Creme set her paws on the grass again without her running away. She's been deprived of the nature since we took her in.